It’s early morning and I’m enjoying some peace and quiet before my tribe of six offspring (plus partners and grandchildren) invade for Sunday/Mother’s Day lunch. We tend to spend Mother’s Day here, at our house, because we have the biggest dining table for seating everyone. Besides, I love to cook for them all. I’m also looking forward to receiving my selection of lovely cards, flowers, chocolates and whatever other knick-knacks they decide I might like this year. I’ve never asked it of them, but I sincerely appreciate all that they bring. It’s like Christmas all over again. And to think, my birthday’s less than a month away, too. Well, today I thought I’d have a think about what Mother’s day actually involves in the U.K. and how it originated. I won’t delve into how the celebration started in the U.S. in 1908 – which, I believe, is celebrated in May. There’ll undoubtedly be plenty of American bloggers to do that when the time comes. The actual term Mother’s Day, which stems from the American celebration, has now been adopted in many parts of the world and is usually celebrated either in March or May. Here in the U.K. Mother’s Day is celebrated on the fourth Sunday of Lent, so the date varies from year to year, depending on the dates of Lent (in turn dependent upon the date of Easter). It was observed as early as the 16th Century, when it was known as Mothering Sunday. This was a time when people returned to the ‘mother church’ – the main church or cathedral in the area – for a special service called Laetare. The day was one of relaxation from normal Lenten observations; a day of hope with Easter being at last within sight. Mothering Sunday was often the only time when the whole families could be together due to conflicting working hours on other days. Children and young people ‘in service’, as household servants, were given the day off to visit their families. Children often picked wild flowers on the way, either to put in church or give to their mothers. So eventually the tradition evolved into the giving of gifts to mothers. But Mothering Sunday was by no means a new idea, even in the 16th Century. Celebrations of mothers and motherhood can be traced back to the ancient Greeks and Romans, who held festivals in honour of the mother goddesses Rhea and Cybele. In the U.K. today, Mothering Sunday is known by the American term of Mother’s Day, as it is in most countries where the Day is celebrated. 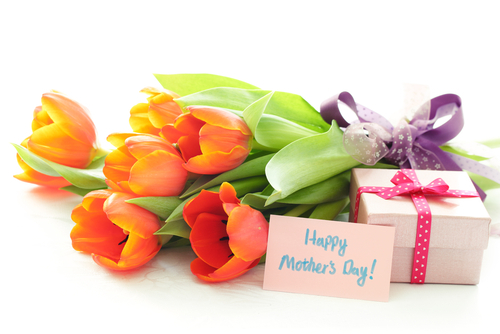 Many gifts are given to mothers, including the traditional flowers. Chocolates are also still popular, but a variety of other gifts are given as well. 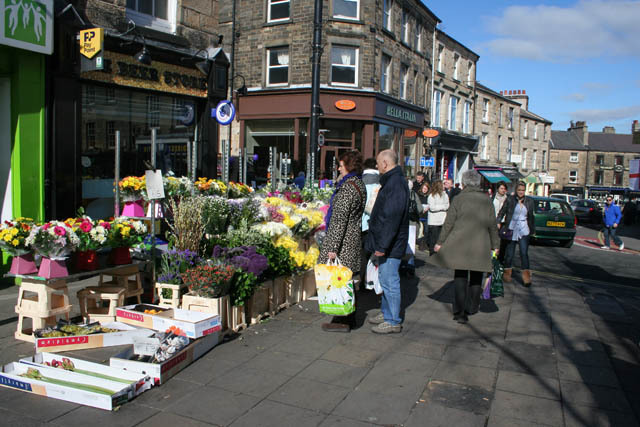 Unfortunately, as is to be expected, the cost of flowers rises dramatically as the special day approaches. In the early days, Mothering Sunday was also known as Refreshment Sunday because the fasting rules for Lent were relaxed for that day. 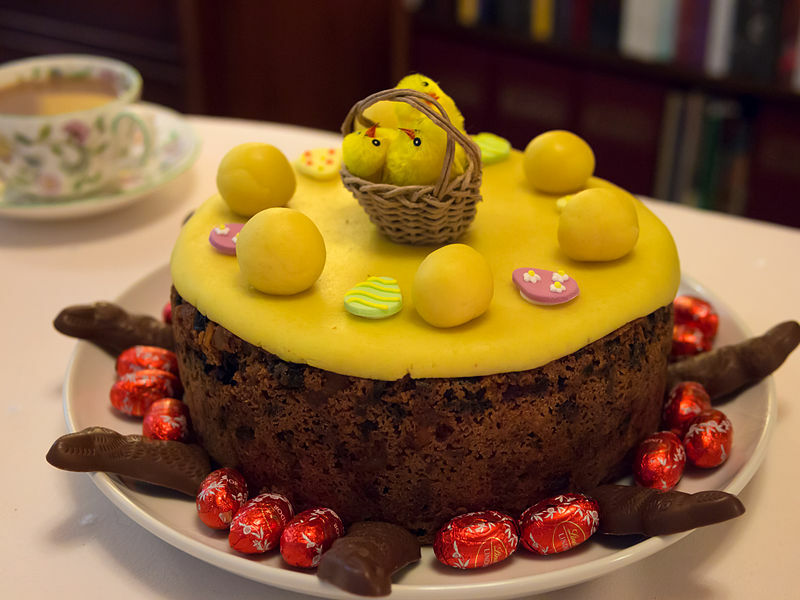 The special food item associated with the Day was Simnel cake – a fruit cake with two layers of almond paste (marzipan) one on top and one in the middle. It is made with eleven balls of marzipan on top, representing the eleven disciples. (Judas is not included.) Traditionally, sugar violets would also be added. 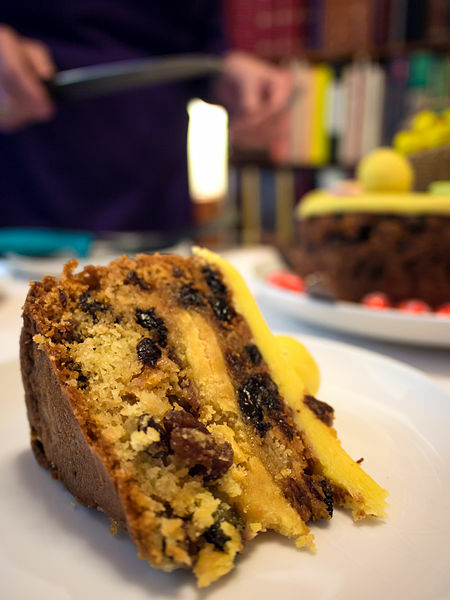 Simnel Cake. Both images: Wikimedia Commons. Attribution: James Petts, London, England. The name Simnel probably comes from the Latin word simila, referring to a fine wheat flour usually used for baking cakes. A legend has it that a man called Simon and his wife Nell argued over whether the cake for Mothering Sunday should be baked or boiled. In the end they did both, so the cake was named after both of them: SIM-NELL. For me, Mother’s Day is also a day when I remember my own mother and the many Mother’s Days we shared. She passed away in 1998 and I still think of her a lot. But especially on Mother’s Day. What is an odd choc, Millie? Is that a British thing for chocolate? Why on this earth would you deprive yourself of chocolate, are you feeling ok? Thanks for the history! I was actually discussing the origin of the day when I was over at mum and dad’s for lunch earlier today. I was also curious as to why it was only a week after mum’s birthday this year and wondered if it was anything to do with the early Easter. I’ll email mum the link to this page so she can read all about it (a few months ago dad bought her a tablet and now there’s no stopping her!). It was cool that you explained it all straight after my mum and I were wondering about it! My mum’s tablet has opened up a whole new world for her 🙂 Computers terrify her but she loves her tablet. Computers terrrify me as well! Tablets are much easier to manipulate, although I wouldn’t be without my laptop for my writing. I’m really glad you found my post helpful. So many countries celebrate the Day on the same date as the U.S. (second Sunday in May) – including Australia. How sweet. I didn’t know anything about the tradition of Mother’s day in the U.K. Thanks for your informative and touching post. I always love to see what you have to say, Millie. Well I am so glad that you have done the research[and now I do not have to] I will thank also for noting the the difference between English and American, and I assume Australian? Yes, and all those other provinces[countries y’all claimed in the past] ( ;)-[ Hoping your sense of humor is as broad as I expect! Love that sense of humor! Yes, it’s hard to get over the loss of a mother. I was very close to mine, and miss her still. She was 77 when she died and I’d imagined her living well into her 90s. She was always so robust – untl cancer claimed her. Thank you for understanding, Scrapydo. I am so glad you got to spend some time with your children and grandchildren on Mother’s Day Millie! I hope it was a day full of joy for you! (We celebrate ours in the second week of May). Like Christmas, Easter, birthdays and a host of other anniversaries, Mother’s Day comes but once a year. And like all of the others, that’s part of the reason why it’s so special. I’ve had a wonderful day with the family so far, and have so many flowers that the house looks like a Garden Centre! Mother’s Day in the U.K. has an interesting history, and as I’ve nothing extra to add to what I wrote last year, I thought I’d simply reblog. I know! I’ve missed you! That’s very kind of you. I hope that your absence is the result of an overload of real life fun. Iceland clings to old traditions, and is somewhere I’d like to go one day. The Christmas tradition is a very sensible one, if you ask me. 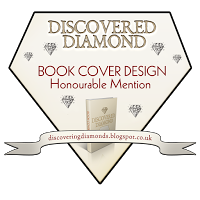 It sounds a wonderful way of encouraging children – and adults – to read. I’ll make a note of the blog to check out. Thanks for this, Clare. The Blog is The Turtle Way and the tradition is called Christmas Book Flood Jolabokafloo She has links to articles about the celebration.